November 28, 2009 Sohail A. and Friends Yosef, Omar and SairahHave a great Time onBig Lake! November 28, 2009 Sohail A. and Friends Yosef, Omar and SairahHave a great Time onBig Lake! It was Sohail’s and Yosef’s second time fishing ever. (The first was two years ago with Captain Tom). And it was Sairah’s and Omar’s first time ever to fish and now they are hooked! Sairah started with a bang catching the first fish and the most, showing up the guys. But everyone caught fish and had a great time with a lot of casting help from Captain Tom. November 27, 2009 Jon Father (Visiting from Denver) and Friend Limit at 10:30 AM!!!! November 24, 2009 Shawn & Thomas Visit Big Lake for the Holiday!!! November 24, 2009 Shawn & Thomas Visit Big Lake for the Holiday and have a great time catching Trout & Reds. How Lucky to have a grandfather whose a fishing Guide! 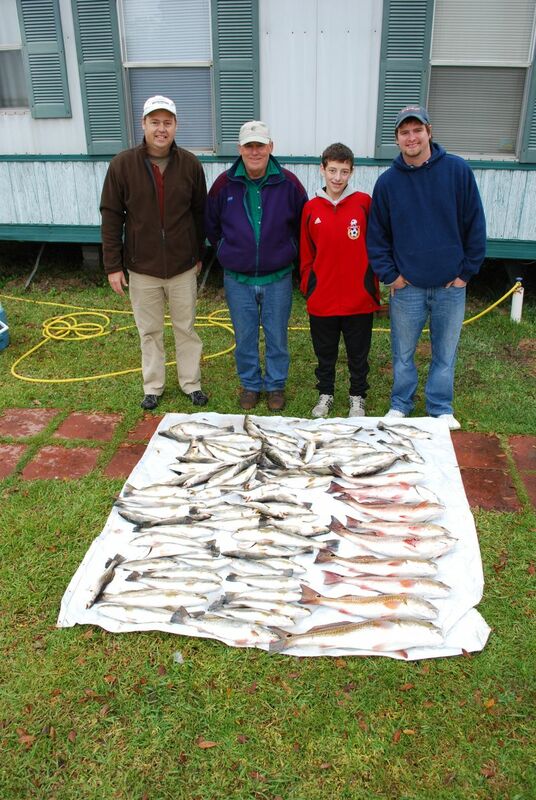 November 22, 2009 Three Generations of Millers Limit out by 10:30 on their yearly Adventure to Big Lake!!!! November 20, 2009 Rob M. & Friends Brave the Rain, Cold, & Wind to Catch a Big Lake Bunch!!! 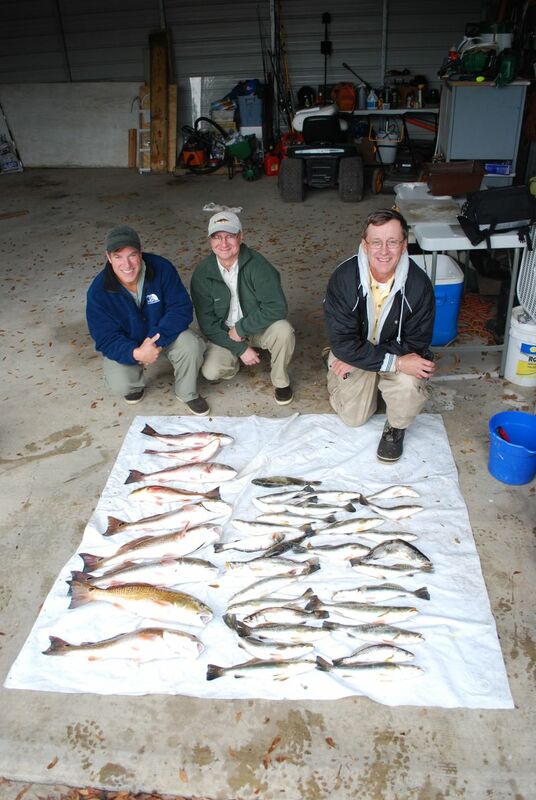 November 20, 2009 Rob M. & Friends Brave the Rain, Cold, & Wind to Catch a Big Lake Bunch!!! It was a slow start with 20 MPH winds and a steady heavy drizzle but persistace paid off. Gulp under a cork was the best bait to fill the cooler. As the day progressed the fishing improved and at 2 PM we had to leave the birds flying and the fish biting! I was not surprised when Rob & Friends started wacking them since they are card carrying semi-professional fisherman!! Great job guys!!!!! November 18, 2009 Jason & Friends Visit Big Lake and Knock Em Dead!!!! November 18,2009 Was a day to remember. 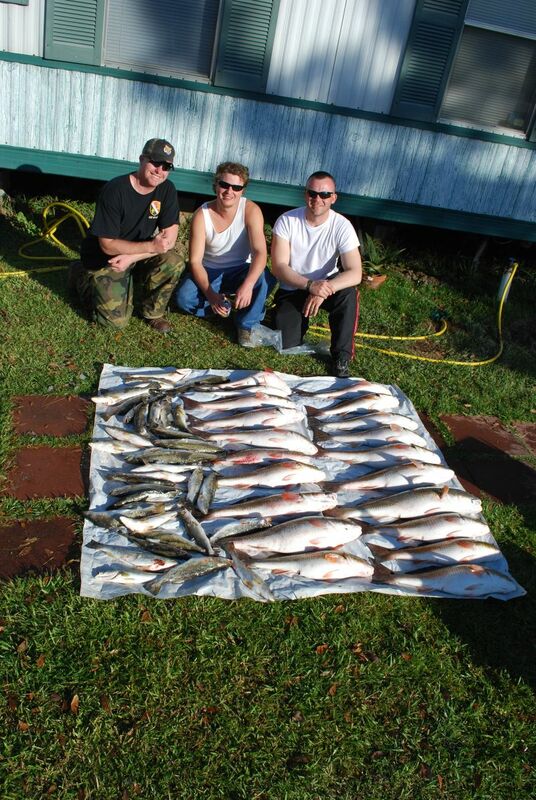 It took 3 Coolers to hold all the fish Jason and his friends caught today! Gulp and V&M Minnows did the trick . This was the heaviest catch ever! Great Job Guys!!!!! !